For the last two years I’ve been pondering what art will sound like in the future. One of my wilder speculations suggests that we will choose to dispense with the corporeal and upload ourselves into a hive mind. Because a hive mind shares hopes and dreams, and everyone’s secret dream is to be a rock star, I conclude that at the end of time we will manifest as a band—The Omega Point Band—transmitting to infinite space. As I was working on this scenario I came across cellF, a recent project by bio-artist Guy Ben-Ary, in which he grows neural networks (a proto-brain) developed from his own cellular material. And what does this brain want to be when it grows up? A rock star of course—well, an improvising musician really. 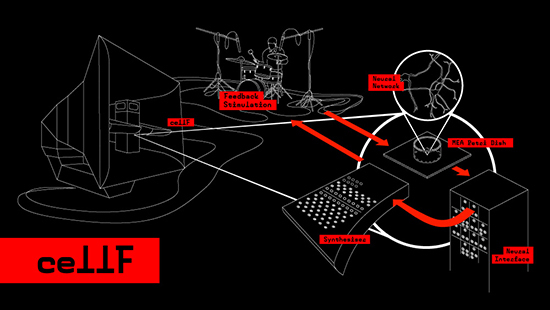 CellF has been in development for over four years, initiated when Ben-Ary received a 2012 Creative Australia Fellowship. It had its debut performance in Perth in October 2015, presented by SymbioticA, and will soon have a second iteration in Sydney as part of The Patient, the upcoming bio-art exhibition curated by Bec Dean at UNSW Galleries. I talked with Ben-Ary last year when cellF was still in development and followed up recently to see how his other “brain” took to its debut performance and their combined feelings around the upcoming tour. The final result is a neuronal network grown onto the Multi-Electrode Array Interface ready to be stimulated. Which is where the aesthetic decisions—the life choices perhaps—began. While Ben-Ary’s intention is to make a self-portrait, he wanted to avoid a predominantly visual representation. “I look at myself in the mirror enough, and I kept looking at the cells for 18 months—every single day—so I just couldn’t think about humanistic portraiture, or describing myself in these terms.” In previous works like MEART and Silent Barrage Ben-Ary has used robotics to physically manifest the work, but for cellF he wanted to go in a different direction. He talks of his long-held fascination with music—“when I was 12 I’d put David Bowie’s make-up on my face.” In particular he developed a passion for experimental music and jazz—“John Zorn changed my life”—but he just never developed the skills to be a musician. So he decided that this self-portrait—this auxiliary Ben-Ary brain—could live this dream for him. Finally he could become a rock star. The actual physical body of the neurons has been designed by Thompson to fulfil both practical and aesthetic needs. The system not only has to house the spaghetti monster that is a modular synthesiser system, but it also has to be a functioning bio-lab with a fridge, incubator, the neural interface as the “head” and a class 2 sterile hood because of the use of modified human cells. Drawing inspiration from Futurist Luigi Russolo’s intonarumori noise machines, 1950s-60s giant gramophone speakers and the spiral structure of the cochlear, the neuronal network’s body is quite a magnificent sculptural object. When the neurons are not performing, sleeping off their rock star hangovers in their fancy multi-electrode array hotel beds, the project can be experienced via image and video documentation and prototype displays. 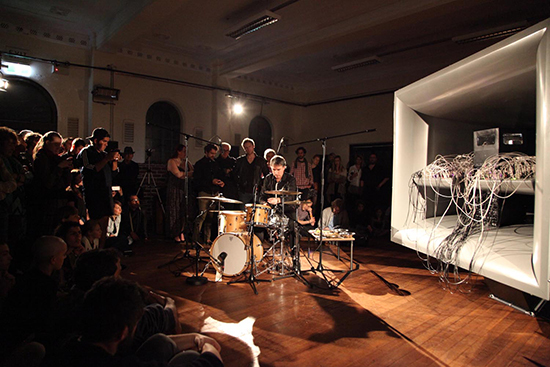 Hoping to tour the work further, Ben-Ary also sees the opportunity for developing an installation version where the neurons can be allowed to spend their days composing—singing to themselves. While cellF has a very playful presentation mode, it is a serious exploration of posthuman futures and our sense of ‘self.’ It probes fundamental questions: what makes a mind, what is consciousness and how are we connected to flesh and physicality? Guy Ben-Ary’s approach illustrates the idea of art as a tool for speculative dreaming. He says, “Art can help us with imagining the future. We don’t need to do it, we need to suggest. Symbolic gestures are sometimes enough, and pushing the technology to the limits, the nowadays limits, is enough to look at contestable futures.” I look forward to checking out cellF’s chops, and then I’ll decide if this is a sonic future I want to come true. 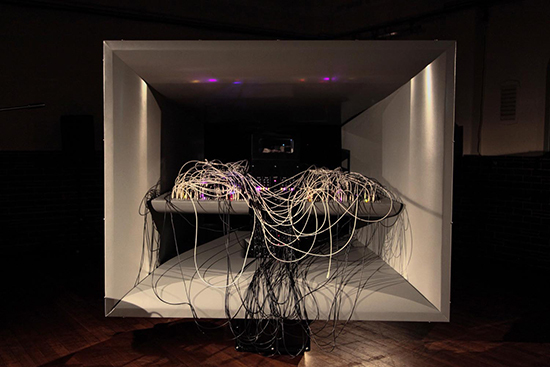 Parts of this interview also appear in audio format in the installation by Gail Priest, Sounding the Future, exhibited in ISEA2016.